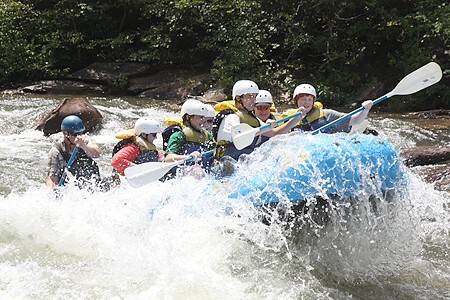 Home » Archives » White Water Rafting on the Ocoee River! 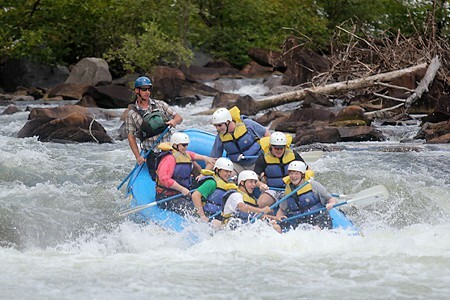 White Water Rafting on the Ocoee River! I’ m making a little departure from recipes today because I just have to tell you about last weekend. Now, I’m not a daredevil. In fact I’m pretty much the opposite of a daredevil. Especially when it comes to activities that could actually cause me bodily harm. Which is why it was so surprising that I really wanted to go white water rafting. Yes, you heard me right. White. Water. Rafting. Actually, this all started about a year ago when BeeBop and our grandson had a reservation to go rafting on the Ocoee River in Tennessee. On the day of the trip, A woke up sick and they had to cancel. So the nice people at the rafting place gave us a credit that we could use any time within a year. A few months ago, BeeBop said “Hey, we still have that credit for the rafting trip. Do you want to go?” And before you know it, I said “sure!” and we were all set. Now this type of activity is completely, totally out of my comfort zone. Like on the other side of the world out of my comfort zone. But I was excited about it. I figure I might as well live a little before I get too old to do things like this. Right? So last Sunday afternoon, we arrived at the river ready for our adventure. I have to admit that I was pretty apprehensive after hearing the safety talk and getting all geared up. I mean you have to wear a crash helmet for goodness sake. But I was determined to be a trooper and see it through. That’s me in the orange shirt holding on to BeeBop for dear life. The trip starts out immediately in wildly rushing, splashing, frantic water that is at once both fun and terrifying. Honestly, I questioned for the first 15 minutes or so whether I could really do this thing, but I started getting more comfortable and settled in with steely determination. Almost halfway through the trip, we hit an area of rapids which seemed particularly difficult. Before I knew what was happening, I was thrown off my perch and into the bottom of the boat. That wasn’t the bad part. The bad part was that my leg and ankle rolled to the left while my foot remained stationary. Ouch. I turned around immediately and told our guide that I thought I had broken my ankle. Turns out I was right. Luckily we were in a great location for getting off the river. Our guide expertly navigated our raft to the bank of the river. Then several guides from other boats pitched in to wrap and tape my ankle before I ever got out of the raft. Then they called for transportation and got me up the river bank to the road – no easy feat climbing a steep river bank with a broken ankle, let me tell you! 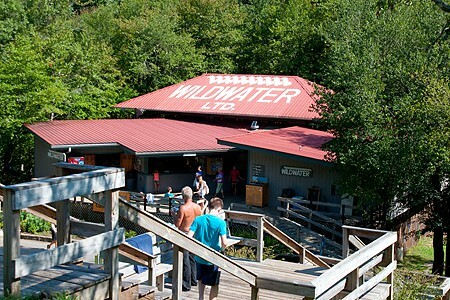 My most grateful thanks are due to the staff at Wildwater Rafting for their concern and assistance on Sunday afternoon! Especially our guide, Don, and Misty who met us back at the site and helped me with everything from getting into dry, clean clothes to getting in the car for the trip home. They’re a group of thoroughly professional folks who really know what they’re doing and have a great appreciation for the outdoors. So now, all that’s left is to recover. My doctor says it will take about 4 to 6 weeks and that everything should be just fine. Right now it hurts like heck, though, and being immobile is kinda making me nuts. But I’m following doctor’s orders and my wonderful husband is taking care of everything, and I do mean everything, that I can’t handle for myself right now. He’s pretty awesome that way and I love him so much I can’t even explain it. By the way, we spent our 24th wedding anniversary at the doctor’s office getting my ankle taken care of. Neither of us minded in the least. So tell me – what’s the most daring thing you’ve done this summer? I need to make plans for when my ankle heals! Previous Post: « Brown Sugar Bacon – Love it or Leave it? That’s MY MAMA!!! She’s so freaking awesome! Thanks, sweetie! You’re pretty darned awesome yourself. Nothing ventured; nothing broken right? I’m so sorry you got hurt but I’m also pretty dadgum impressed you did it at all. I’ve been a couple of times on the Colorado River but was much younger…you know when you don’t think much about safety at all. Love that, Barb – “nothing ventured; nothing broken.” And, yes, as we get older (and wiser) we do think more about safety, don’t we? Lots of things I did in my youth I’d never even consider now. But I thought a nice little trip down the river would be a pleasant way to spend a Sunday afternoon. Oops. They advertise this trip as being for ages 12 and up. However, I honestly think it should be older teens and up. That water is really, really fast and rough and you need a lot of strength in your arms and legs to stay secure in the raft. Lana – I applaud you for heading the call for adventure! I wish you a very speedy recovery!! Thanks so much, Aly! I’m just hoping the time passes quickly. Hope you feel better soon. Do all that your doctor and physical therapist recommend. It is definitely work! You’ll be tired when you get off the river. For sure. How fun! I’ve done white water rafting once and LOVED it! 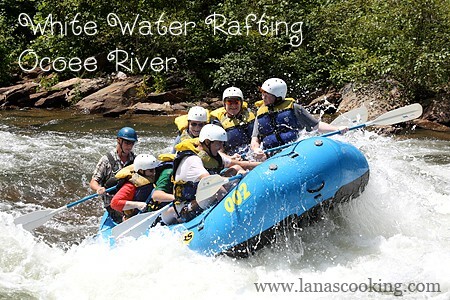 I actually live about 30 minutes (give or take) from the Ocoee River and have never gone rafting!